We know where and when the ALB vets were born, their political affiliations, which battles they fought in, and when they died. For too many Abraham Lincoln Brigade vets, this is all the information we have. In Samuel Waitzman’s case, that all changed with an email. Waitzman, Samuel. b. February 19, 1911, NYC, Jewish, Attended City of College of New York, Single, Journalist, (YCL & CP 1931) CP November 1935, u. org., Received passport# 36840 February 20, 1937 which listed his address as 680 East 140th Street, Bronx, New York and 600 East 139th Street, NYC (47 W. 87th Street, NYC), Sailed March 18, 1937, Normandie, Arrived in Spain on March 28, 1937, Served with the XV BDE, Washington BN; BDE Transport; 35th Division Sanidad; XV BDE, Sanidad, last unit British BN, rank Soldado; Served at Brunete, Quinto, Belchite, Fuentes del Ebro, Teruel, Seguro de los Baños, Retreats and Ebro Offensive; WIA July 28, 1937; Returned to the US on December 20, 1938 aboard the Ausonia, d. January 1982, New Jersey. In the Tamiment ALB Archives there is one picture of Samuel Waitzman and a file for him in the collection of complaints of discrimination filed by ALB vets against the U.S. military during World War II. We know where and when the ALB vets were born, often their political affiliations, which battles they fought in, and when they died. For too many Abraham Lincoln Brigade vets, this is all the information we have. What we don’t often know is how they coped in Spain — with the violence, rugged conditions, displacement from their families. We have some information on these issues, but they are mostly based on reflections years after their service. In Samuel Waitzman’s case, that all changed with an email. My father, Samuel Waitzman (1911-1982) fought in Spain as a member of the Abraham Lincoln Brigade, arriving in April of 1937, I believe, and departing in December, 1938. He was a writer. He wrote extensive diaries in Spain, including some poetry and additional letters that we have in our possession. I think these are important historical documents, and I was wondering if you might be interested in archiving them in the Tamiment Collection? Briefly, the handwritten diaries span from March 1937 to October 1938 (with specific dates included on entries). In total there are about 600 pages (about 5”x3” — some a little larger) with about 200-400 words on each page (these have all been scanned). There are also 55 pages of letters that have been scanned. Several entries bear on specific battles in the war, including Albacete and Valencia. They include descriptions of day to day life in Spain, interactions with locals, conversations on politics, some poems, song lyrics and sketches, and some intermittent Spanish phrases. 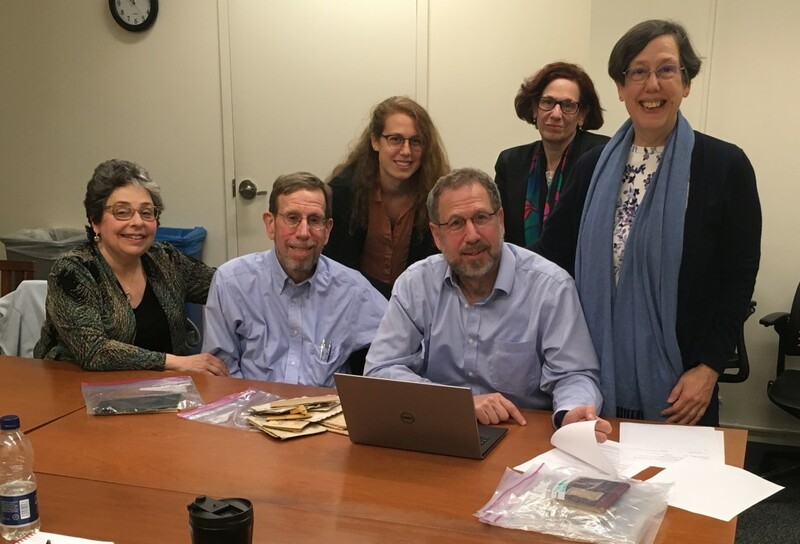 I, along with my siblings and my daughter, will be visiting NYC (incidentally Sam’s birthplace as well as my own and two of my siblings) on Friday 5/12, and I would like to discuss with a curator or other relevant official connected with the Collection, the diaries and letters and whether the Library has an interest in being the repository for them. Please reply at your earliest convenience as to whether we can arrange for a meeting. 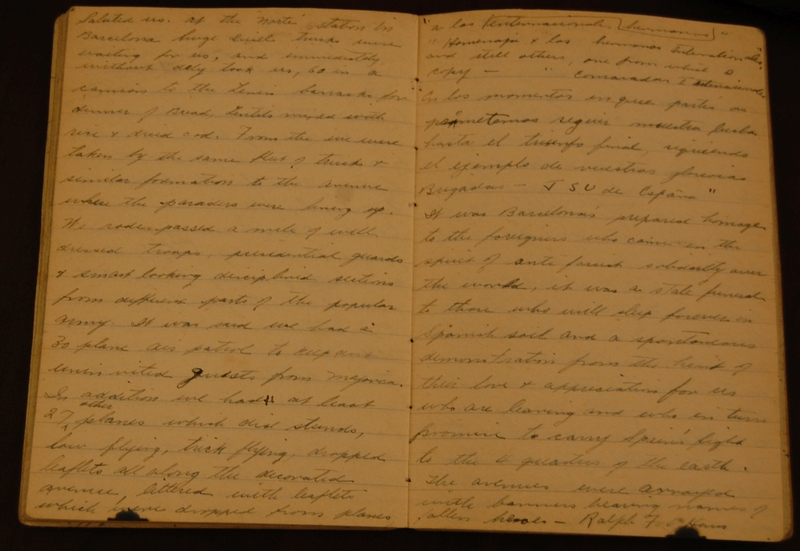 The Waitzman family (Norman, his brother David and his wife Marcia, his sisters Deborah and Mimi, and Norman’s daughter, Emma) presented these documents to Tamiment on May 12. Had an argument with someone about [… ] despised persons who died like heroes, committing acts of personal bravery to compensate for long periods of bad management – […] it is demagogue, apolitical […] not working together with fellowmen – that alas was their error afore then – why then should we honor the biggest and final error and raise it to a noble deed – when such courage is itself a declaration of contempt for collective effort? I was accused of criticizing too finely – splitting hairs – where are we to get other leaders –where the working class should, has, and must get theirs from – the masses throws* up leaders –develops them. A leader is one who can direct his following according to situations, with kindness, understanding + sincerity, regardless [of] pastime. Portions of Samuel Waitzman’s illuminating collection will be on display in Tamiment on Saturday, September 9, 2017, along with other recent additions to the ALB archive, including a recently acquired stretcher (the only one known in existence) that was used by the ALB. Timothy V. Johnson is head of the Tamiment Library and an ALBA Board member.